Stella Artois isn't going to let wine tastings have all the fun. Beer has plenty of flavors and tasting notes to explore, and the brand is doing just that with a music video by The Roots that highlights the beer's flavors. The video is part of Le Savoir, a multisensory entertainment platform and dining experience held earlier this month in Montreal, this week in New York, and in Buenos Aires in September. Sid Lee of New York developed the experience with The Roots, food scientists Bompas & Parr and 45 Degrees, Cirque du Soleil's events and special projects company. To develop what it's billing as "the first music video you can taste," Stella Artois and Sid Lee created a set of sounds that people associate with certain flavors in a Stella Artois. "Sounds can influence your sense of flavor," explained Dan Chandler, executive creative director at Sid Lee. "We found fruity pineapple notes, for instance, and then asked people what sounds they represent. All of the sounds were then added to the video, to bring out the fruity or sweeter notes, or the bitter notes that come from the hops in the beer." 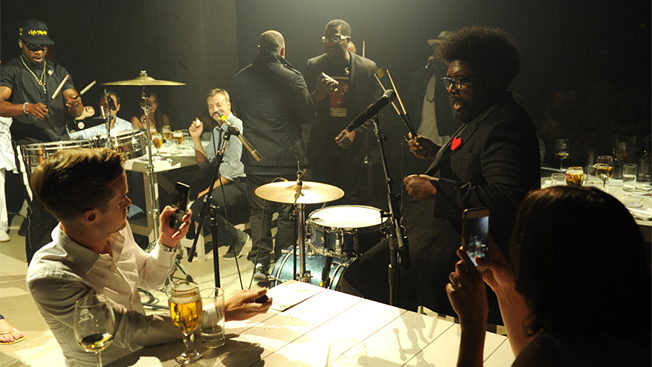 The Roots created a track for the video that has two different versions: one with higher pitches bringing out sweeter flavors and another with lower pitches bringing out bitter flavors in the beer. The Le Savoir events include performances by The Roots and a four-course dinner with beer and food pairings. Stella Artois also is partnering with bars and restaurants to host scaled-down versions of Le Savoir and will create online kits to help people create their own Le Savoir experiences at home. The goal of Le Savoir is to create an unforgettable experience that will further endear millennials, in particular, to the brand, said Todd Allen, vp of global marketing at Stella Artois. "It's bringing millennials' passion points of food, music and art together under one platform to deliver an immersive dining experience, all perfectly paired with Stella Artois," he said. "We're very excited to bring it to the market."